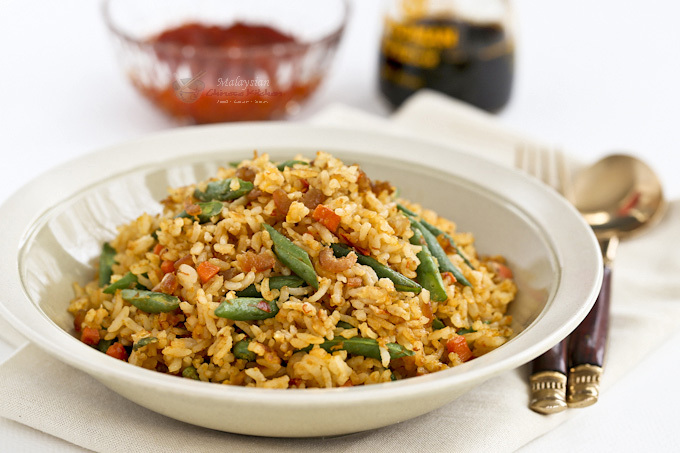 Spicy Fried Rice with dried shrimps, carrots, green beans, eggs, and homemade fried chili paste. Can be prepared in 30 minutes for a quick and tasty lunch. Rinse dried shrimps. Soak in warm water for 10 minutes. Then drain and give it a coarse chop. Heat vegetable oil in a large wok or fry pan. Add prepared dried shrimps. Fry until fragrant and crispy. This should take about 2 to 3 minutes. Remove fried shrimps, leaving the oil in the pan. Set aside. Add garlic and fry for 30 seconds. Stir in fried chili paste. Add carrots and green beans. Continue to cook for 2 to 3 minutes. Then add cooked rice and soy sauce. Stir to get everything well mixed. Using the spatula, create a well in the center of the pan. Crack the eggs into the well and fold the rice back onto the eggs. Continue to stir until the eggs are cooked and rice is dry and fluffy. This will take 4 to 5 minutes. Return fried dried shrimps to the pan. Stir to mix it in. Turn off the stove. Dish into individual serving plates and serve immediately.